After extensive testing at Graphics One we are pleased to announce the new Mutoh VJ-1628WX is ready to be launched. 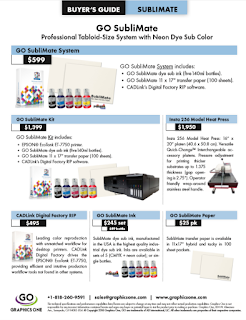 Using 8 outrageous colors from GO's NeoTack colors, we can confidently say the new 1628WX offers the widest and most amazing dye sub ink color imaging in the business. The new VJ1628WX features the latest print head from EPSON for high resolution color pop imaging. With imaging up to 1440 dpi and speeds up to 600 sq ft per hour, this new printer offers great performance at value pricing especially when paired with GO' NeoTack Dye Sub ink.